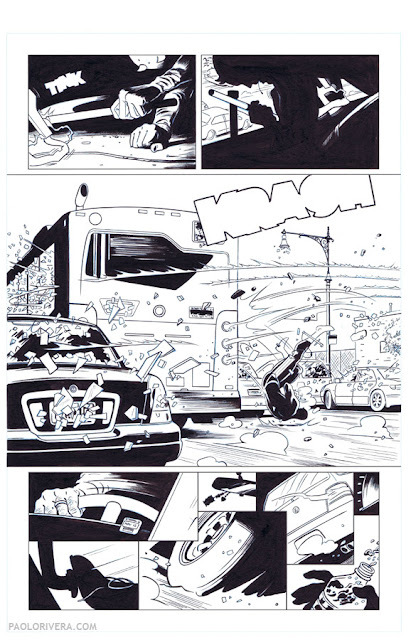 Daredevil #3 Page 13. 2011. Ink(ed by Joe Rivera) on Marvel board, 11 × 17.25″. My pleasure, Ray. Glad you liked it. So awesome. You trying something different with your layout and digital composites or were you crunched on time? Page looks great. 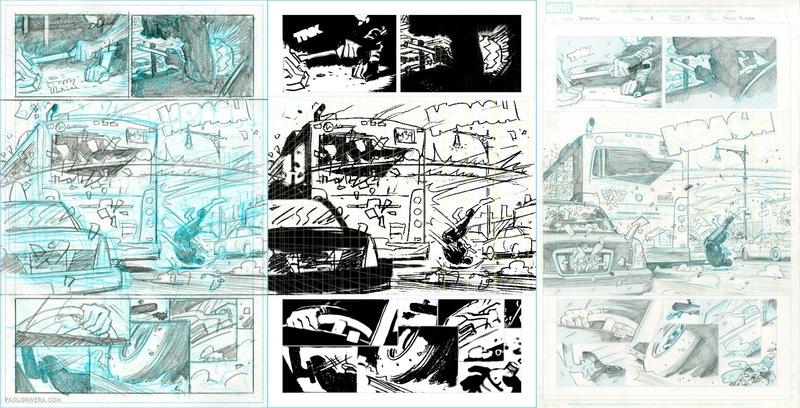 One thing you have taught me with you sharing your process pics is to keep clean lines in the thumbnail stage. I used to be all scratchy and fast with it, but taking the time to make the thumb clean goes a long ways for later in the process. I've been using digital composites for quite some time now. I did, however, just start doing all-digital layouts. I'll post them as soon as issue #9 comes out. I should also note that these are the layouts that I show to my editors for approval, so there are many, many side-sketches that are unintelligible to all but me. Thanks, Ruben! The grid that you see in the digital composite isn't actually 3D, just a 2D grid that I transformed. I've got a whole template system that deserves its own post.